On the auspicious occasion of Mahashivratri, Prime Minister Narendra Modi today unveiled a 112-feet tall statue of Lord Shiva in Coimbatore. He also termed unity in diversity as the specialty and strength of the Indian culture. 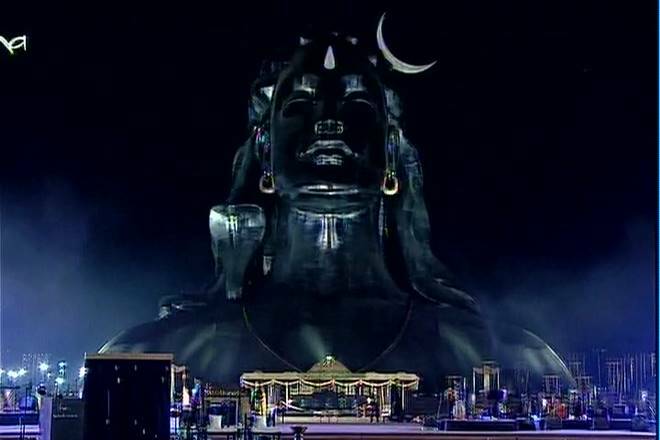 "This (Maha Shivaratri celebrations) symbolises a spirit of vigilance, that we have to protect nature and mould our activities in sync with our ecological surroundings," he said addressing a gathering after unveiling a mammoth 112 feet bust of 'Adiyogi" Lord Shiva at Isha Yoga Foundation here. Underlining the need for peaceful coexistence, Modi said, "Lord Shiva is everywhere" and referred to the bull, peacock and mouse that were the vehicles of the Lord and his sons -- Ganapathy and Karthik. He also talked about the venomous snake Vasuki curled around Shiva's neck to emphasise the importance of peaceful coexistence. He asked people to remain united, insisting unity in diversity was special to Indian culture. Praising the ancient practice of Yoga, whose goal is to bring the practitioner's body, mind and spirit in tune with each other, Modi told the gathering that by "practising Yoga, a spirit of oneness is created. Oneness of mind, body and the intellect, oneness with our families and with the society we live in, with fellow humans and with birds, animals and trees." "This is Yoga, Yoga is a journey from me to we," he said, emphasising India's biggest strength was its diversity. Modi began his speech by greeting people in Tamil "Ungal Ellorukkum En Anbana Vanakkam," (My loving greetings to all). 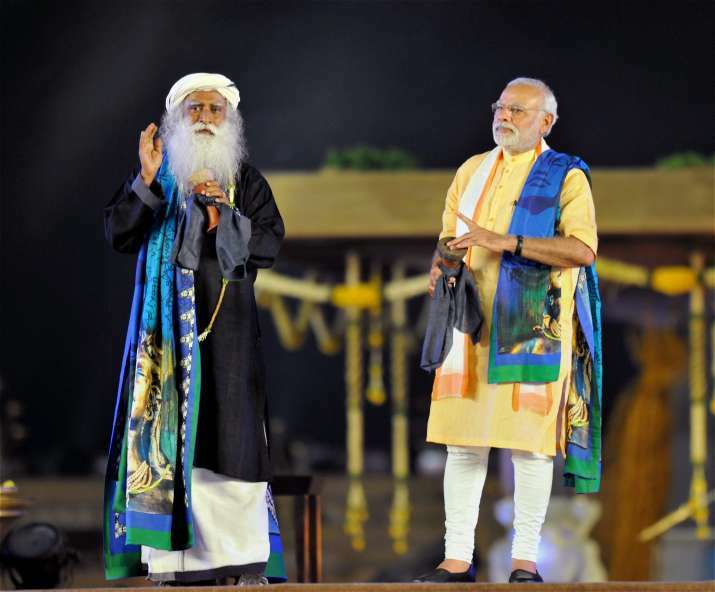 Founder of Isha Foundation, Jaggi Vasudev, said the bust of 'Adiyogi' was built in eight months. He also lauded Modi for practising Yoga. 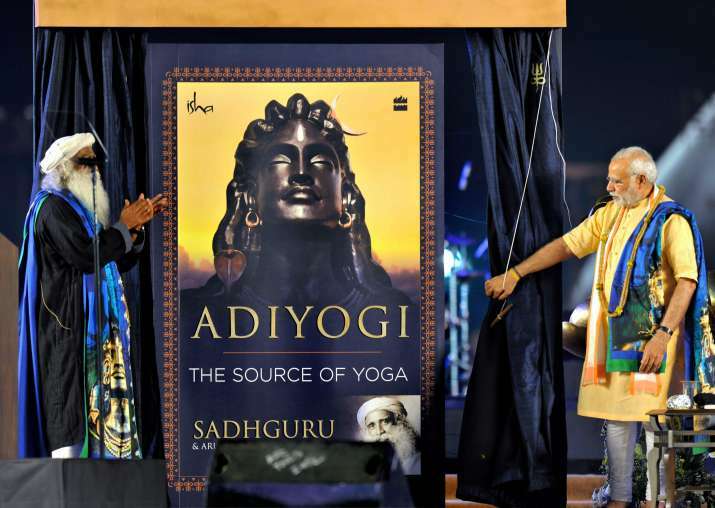 Before unveiling the giant 'Adiyogi' bust, Modi lighted the "Maha Yoga Yagna" and released the book 'Adiyoga: The source of Yoga', which deals with yogic sciences. 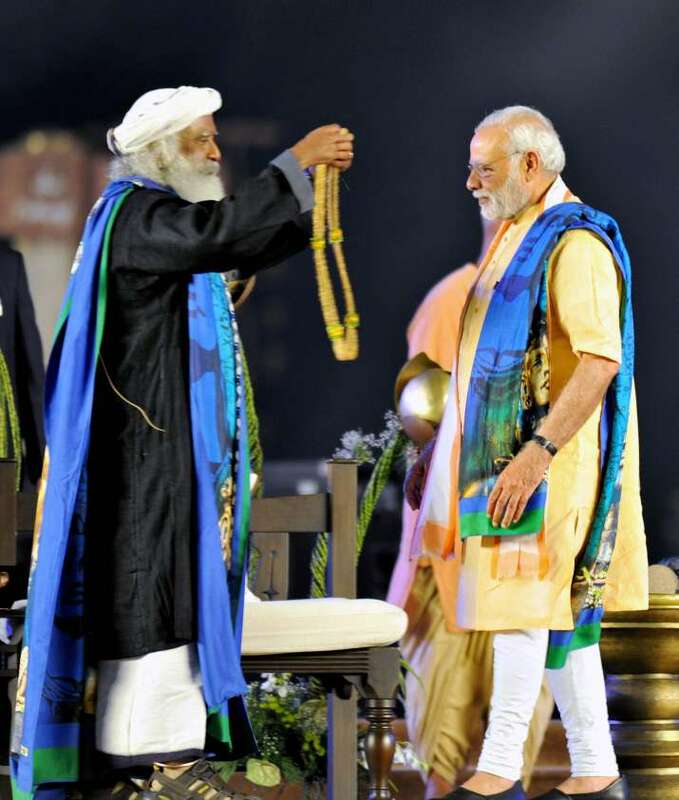 Modi was shown around various places in the Isha Yoga complex, including the Dhyana Linga, Surya Kund, Nandi statue and the inner and outer corridors (prakaras) by Sadhguru Vasudev. The Prime Minister offered aarti and showered flower petals over the Dhyana Linga. He later sat in the Dhyana Linga mandapam, where a yogic dance was performed by a group of youngsters to the accompaniment of traditional music and Sanskrit shlokas. Modi briefly sat alongside Vasudev in a meditative posture. The city and the venue of the event was placed under a multi-tier security cover by police and the Special Protection Group, which guards the Prime Minister. Tamil Nadu Governor Ch Vidyasagar Rao and Chief Minister Edappadi K Palaniswami received Modi on his arrival here. Madhya Pradesh Chief Minister Shivraj Singh Chouhan, Union Minister Pon Radhakrishnan and Puducherry Lt Governor Kiran Bedi also attended the event. The statue and the foundation are located in the foothills of Velliangiri mountains in the Western Ghats. The bust was unveiled to coincide with Maha Shivaratri celebrations. * PM Modi unveils 112 foot tall Shiva statue in Coimbatore, Tamil Nadu. What a sight,what a face ! The 112 feet- #AdiyogiSourceOfYoga . Sab me hai Yogi,Jagaane waala chahiye.